Sturdy ice scraper. The worst feeling is going to clean off your car in the morning, and breaking your dollar store scraper, so invest in a one that will last more than a season or two. As a bonus, many have snow brushes, as well. Warm things. Throw an extra blanket, pair of gloves, and sweater in the trunk. In case of an emergency, you may have to change into dry gloves – remember, the cold can turn dangerous very quickly, stay warm. Emergency flares. These should already be in your emergency car kit, but if they are not, get some now. Visibility may be decreased during a storm, making them more crucial. Collapsible shovel. These handy inventions collapse down to about a foot, making them a compact solution to a potentially large problem. Rock salt, sand, or kitty litter. Either of these will help your tires gain traction if they are stuck in the snow. 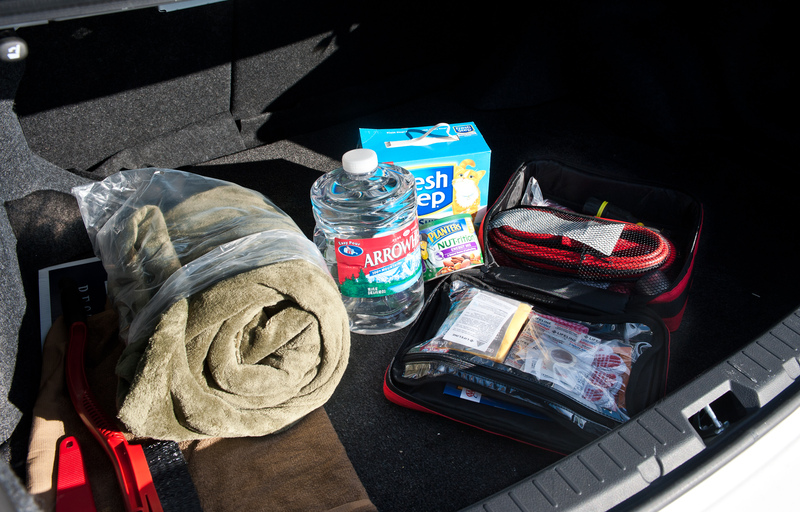 As an added benefit, the bag will add a few pounds of extra weight in the trunk, which also helps increase traction. Personal care products. Water, nonperishable snacks, a cell phone charger, a flashlight, and a basic first aid kit should stay in your car year-round, but especially in winter (when it may take longer for an emergency crew or tow truck to reach you) they become critically important. Standard car kit. Things like jumper cables, a tow chain (or rope), small tool kit, and extra windshield wiper fluid can help you do minor repairs on your own – saving time and money. YouTube is a surprisingly good resource for learning basic mechanical skills, like changing a tire or jumping a battery, so settle in with some hot cocoa and teach yourself something new. While you’re at it, reread our tips on driving in the winter. We hope the rest of your winter is accident free, and you don’t need anything in this kit, but keeping these things in your car can be the difference between a minor inconvenience and a major tragedy.